US - uncensored, EU censored. Previous Interplay-published version supported OS X as well. Comes configured with the Fallout 2 High Resolution Patch and sfall. Comes configured with the Fallout 2 High Resolution Patch and sfall. Fallout Classic Collection includes Fallout, Fallout 2, and Fallout Tactics: Brotherhood of Steel. The digital release of the Mac version is actually a DOS version which uses DOSBox in order to play it, though the retail version was a true native port. Patch v1.02 updates the game to the latest version. Unofficial Fallout 2 patch fixes over 1000 bugs with the game past the last official 1.02 patch. A large amount of restored content. Fallout 2 High Resolution Patch. Vault-Tec Labs Wiki - additional installation information. Save games can be transferred between Windows and OS X installations of the game. Syncs up to 953.67 MB of game data (maximum 1000 files). In-game video settings (GOG.com version). Use Fallout 2 High Resolution Patch. Pre-installed with GOG.com and Steam. Small size of interface. Use Fallout 2 High Resolution Patch. Pre-installed with GOG.com and Steam. 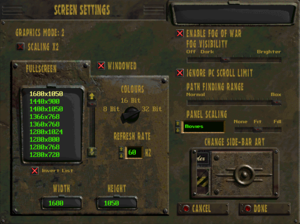 Use Fallout 2 High Resolution Patch or see Windowed. To minimize screen tearing, disable fullscreen optimizations on the executable of the game. Locked at a low frame rate. Mouse movement not clamped to engine frame rate. Check here for the retail and GOG.com versions, and here for the Steam release. See Rainbow color problems in older games for other solutions. Only works in a limited number of cases. mode=4 for fullscreen dx9 mode or mode=5 for windowed dx9 mode. Install the Fallout 2 High Resolution Patch. Create a custom resolution of 640x480 with 60Hz refresh rate and 8 bits per pixel. In the Nvidia Control Panel under Display > Manage. For AMD users, this can be done in the AMD VISION Engine Control Center. 9 Requires the Fallout 2 High Resolution Patch or sfall. 3.0a, 7 DirectDraw 7 support requires the Fallout 2 High Resolution Patch. 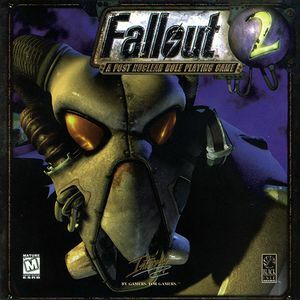 Not compatible with Fallout 2 Restoration Project 2.1.2b (Unofficial Expansion). Vintage Firearms - compatibility requires skipping the install of included item.lst file inside \Data\Proto, use Restoration Project's version instead. Condensed Temple - Restoration Project version here, standalone here. ↑ 2.0 2.1 File/folder structure within this directory reflects the path(s) listed for Windows and/or Steam game data (use Wine regedit to access Windows registry paths). Games with Steam Cloud support may store data in ~/.steam/steam/userdata/<user-id>/38410/ in addition to or instead of this directory. The app ID (38410) may differ in some cases. Treat backslashes as forward slashes. See the glossary page for details. This page was last edited on 28 March 2019, at 18:15.